The wool market seems to be sitting in a comfortable space right now, and despite the drought influence on quality there are minimal price movements week on week. 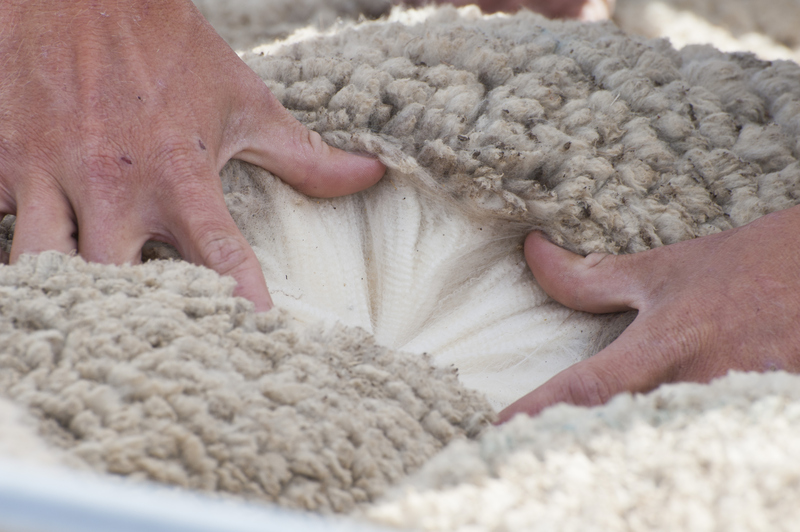 There is a negative impact on the market from the continued supply of low yielding wool coming to the market continues, however the current value of the offering is no doubt being well received by wool producers. Again, AWEX report that the there is insufficient supply of better style high yielding wool to satisfy buyer demand, these types are keenly sought by exporters trying to satisfy demand. They also note that while the market has had a 6-week negative run, it has only retraced 4.5%. The Eastern Market Indicator (EMI) eased slightly giving up 4 cents for the week to settle at 1,943 cents. The Au$ was slightly stronger at US $0.71, with the EMI in US$ terms gaining 1 cent to end the week at 1,383 US cents (Table 1). In Fremantle, the Western Market Indicator (WMI) declined by 4 cents to finish at 2,095 cents. 37,454 bales were offered for sale this week, almost identical to last week with the trade clearing 32,669. This is just 310 fewer bales than last week, however the pass-in rate was again significant at 12.8%. In the auction weeks since the winter recess, 1,124,734 bales have been cleared to the trade, 217,993 fewer than the same period last year. 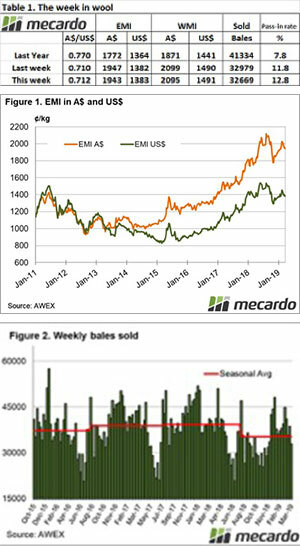 The average shortfall cleared to the trade compared to the same time last year now sits at 6,812 bales per week fewer. For comparison, in the first selling week of April 2018, 51,066 bales were sold. The dollar value for the week was $66.18 million for a combined value of $2.621 billion so far this season. A simple calculation of $ value divided by bales sold gives us $2,025 per bale across all types for the week. Crossbreds continued to defy the easier trend with an increase of 10 to 30 cents across the board. This is the third week in a row of price improvement, however the Cardings sector was mixed declining by 41 cents in Sydney but posting modest gains in Melbourne & Fremantle. The roster for next week has the offering again at 38,712 bales followed by 42,465 before the Easter recess.